Visible Logic coordinated all of our online marketing efforts. Previously, we were paying for a web site, SEO service, online ads and a newsletter service, but the results were not there. Our marketing efforts are now in sync and the different channels are strategically aligned. In 2014 we had our best year since 2008 and picked up 10% more clients than previous years. 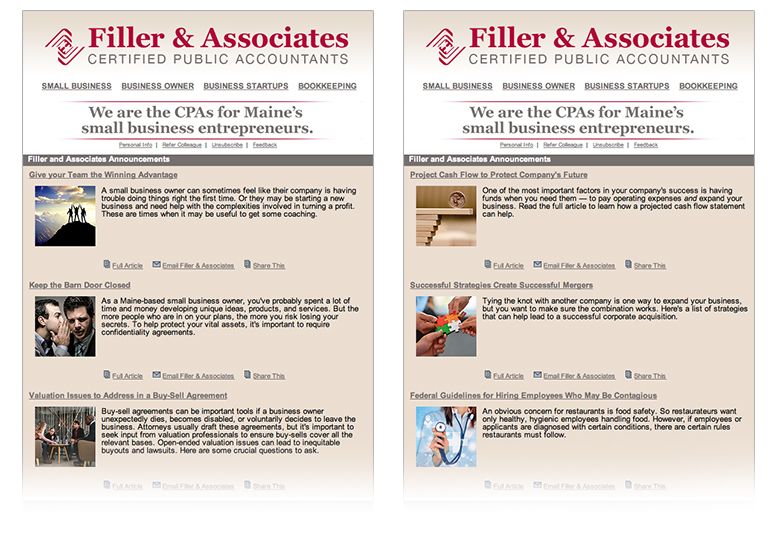 Filler & Associates is a CPA firm providing small business accounting services, business valuation services and litigation support to Maine’s small businesses, startups and area law firms. For more than thirty years, Filler & Associates has been a successful CPA firm. They have successfully retained their clients, but they lacked a cohesive marketing plan to attract new clients. In the past, they had relied on yellow pages ads, but needed a way to replace that marketing tactic with an up-to-date, online strategy. Their web site needed an upgrade to make it more professional looking and to more effectively use search to draw in new customers. They needed to integrate their e-newsletter and web site to create a stronger impact. Filler’s existing web site was a poorly designed, templated site. It was not engaging for viewers and it was difficult for staff to post content in a way that made sense. A new web site was designed, using WordPress. It was completely custom-designed to match Filler’s established brand identity and the content was organized in a logical way. A blog was created to support the content-marketing strategy that Visible Logic launched. Filler & Associates has access to industry-specific articles, but they were losing SEO value by not customizing the content. For search engines, it was being viewed as repetitive content, and for real readers, it need to be tailored to their Maine-based audience. Visible Logic edits and refines each article and we create and post approximately three blogs per week to the Filler.com blog. After upgrading the web site design, Visible Logic redesigned the e-newsletter template to connect visually. Additionally, the e-newsletter now links back to the individual blog posts so that readers connect to the Filler web site and we have more trackable data points. After years of lack luster growth following the recession of 2008, Filler & Associates had their best year in 2014. They were able to attract approximately 10% more clients to their practice than they had in any of the previous years. Their new web site is much more professional looking, is logically organized and is search engine friendly. Their blog drives traffic to the site, accounting for 12% of all web site traffic and more than 14% of entrances into the site. 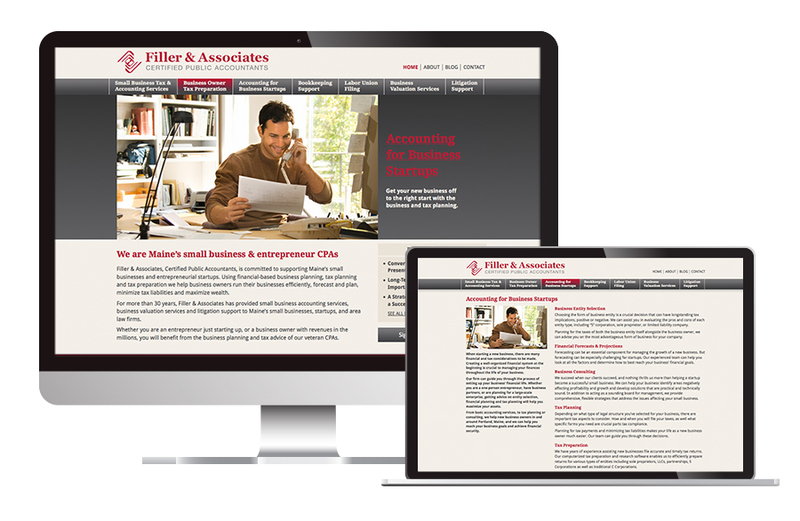 Connecting their e-newsletter content directly with their web site blog has driven additional views of their web site by current clients, exposing them to Filler’s expertise and additional services.